12120 South Michigan Avenue has a Walk Score of 47 out of 100. This location is a Car-Dependent neighborhood so most errands require a car. 12120 South Michigan Avenue is a three minute walk from the ME Metra Electric at the State St. stop. This location is in the West Pullman neighborhood in Chicago. Nearby parks include Kiwanis Field, Lion Field and Kensington Park. Explore how far you can travel by car, bus, bike and foot from 12120 South Michigan Avenue. 12120 South Michigan Avenue has good transit which means many nearby public transportation options. 12120 South Michigan Avenue compared to all of Chicago. How do you feel walking near 12120 South Michigan Avenue? 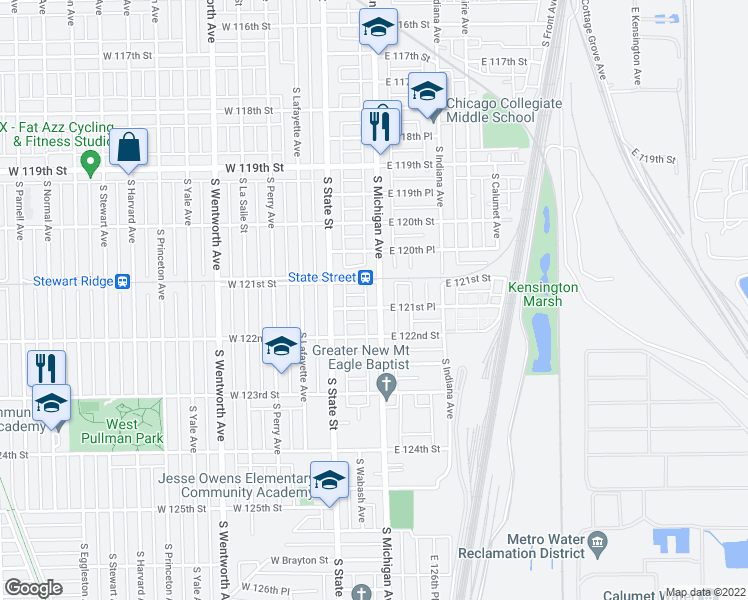 View all West Pullman apartments on a map. Situated on the far south side near the city limits, the West Pullman neighborhood features rows of residential streets filled with neatly manicured lawns and cozy bungalows. 12120 South Michigan Avenue is in the West Pullman neighborhood. West Pullman is the 118th most walkable neighborhood in Chicago with a neighborhood Walk Score of 54.